Call them pumas, mountain lions, cougars, panthers, or any other of their various monikers; the sight of one of these full-grown cats staring down at you from a nearby tree is undeniably exhilarating. As ambush predators, pumas are professional hiders, and even regular visitors to puma habitat will likely go their entire lives without ever catching sight of North America’s largest cat. GPS tracking collars shed light into the mysterious lifestyles of this apex predator. 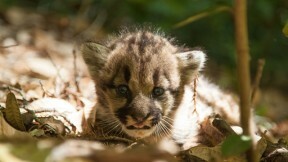 Photo by Paul Houghtailing, Santa Cruz Puma Project. Click on image to see a larger size. On a beautiful summer day, we had the opportunity to follow Field Biologist Paul Houghtaling of the Santa Cruz Puma Project (SCPP) as he searched the rough back roads of the CEMEX Redwoods Property in Davenport, CA. Lead by Chris Wilmers, an Associate Professor of Environmental Studies at University of California Santa Cruz, the team has gained renown for their work tracking the big cats in the Santa Cruz Mountains, as well as some high profile captures of pumas that ventured too close to human habitations. As an apex predator in our Northern California region, mountain lions have huge home ranges. While mother pumas will remain in one area to raise their kittens, pumas generally patrol their territories without making use of any den or other home base. Paul informed us that female mountain lions tend to set their ranges depending on prey availability, which in the Santa Cruz Mountains tends to be deer. Adult males create their home ranges to include female mountain lions and exclude other males. The remaining young male pumas are forced to disperse and seek new territories, and it is often these individuals that get into trouble with humans. Paul Houghtaling and Pilot Mark Dedon secure radio antennas used to upload GPS and accelerometer data from the collared pumas. Photo by Josh Cassidy/KQED. Click on image to see a larger size. As we made our way through the redwoods, Paul occasionally slowed and peered out through the side window of the truck, surveying the dust that accumulates in the inside of the curves of the dirt roads. Traveling pumas rarely obey traffic rules, and tend to cut corners when walking along roads. Paul searched there for footprints and other telltale mountain lion signs. The team employs several other techniques to determine if lions are in the area. This includes laying out road-killed deer with GPS tags in areas thought to be big cat territory. If a hungry lion moves the deer, the GPS tag sends an email to the team, who then head out to investigate. After a few hours of searching, Dan’s voice finally crackled over the radio. His dogs had tracked and treed an adult puma. Once pumas reach adulthood, they live solitary lives, but still need to communicate with each other. One of the main ways they do so is by making ‘scrapes.’ Pumas, particularly adult males, will dig small holes and then urinate on the pile of loose soil created by the digging. Other pumas that frequent the area can interpret the chemical signal to gather information about the cat’s identity and reproductive status based on the signature proteins left behind. Pumas tend to make scrapes in the same areas over time, making it easier for other pumas (and intrepid field biologists) to find learn about which lions are in the area. The research team sets up camera traps in these areas in order to document which cats are have taken up residence in the area. Dan Tichenor, from California Houndsmen for Conservation and his best dog, Osage, a Plott Hound. Paul had memorized the location of several scrapes in the area, and part of his normal search routine is to stop by these areas and look for fresh activity. As he searched, he would regularly make attempts to hail Dan Tichenor, a volunteer from California Houndsmen for Conservation, by radio. Dan had been on the property since before dawn with his pack of specially-bred and -trained hunting dogs. In this mountainous terrain, the radios were unreliable at best, and cell phones were of no use. After a few hours of searching, Dan’s voice finally crackled over the radio. His dogs had tracked and treed an adult puma. We hightailed it to Dan’s location, where Paul was able to capture the puma using a tranquilizer dart fired from a rifle. From the ground, the puma resembled a male lion that had been seen in the area, but when the team got the cat on the ground, it was obvious that this cat, dubbed 38F, was a female. Months later, Paul found 38F again, but this time she was not alone. She had given birth to three healthy kittens. The Santa Cruz Puma Project aims to track these kittens’ location and behavior for their entire lives to learn more about how they use their habitat and how their behavior changes when they come close to human dwellings. Mountain lion populations had declined substantially in the California before they were protected from in the 1970’s. Before that time, hunters were offered a bounty for each puma killed. Since hunting pumas was outlawed, their population has rebounded. Today, they face a new problem. 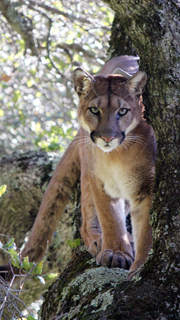 Humans have developed large areas of the Santa Cruz Mountains, building homes, farms and roads in the historical puma habitat. This has lead to an increase in conflicts between humans and the big cats, with pumas often finding themselves on the losing end. Today, the biggest threats to pumas include car strikes, and are targeted by citizens who seek depredation licenses to rid their property of pumas deemed problematic. A new bill, signed into law last week by Governor Jerry Brown will have a substantial effect on California pumas. The bill, SB132 proposed by State Senator Jerry Hill (D.) requires that nonlethal procedures be used to remove any mountain lion that has not been “designated as an imminent threat to public health and safety.” It also authorizes the California Department of Fish and Game to partner with other groups, such as the Santa Cruz Puma Project, to carry out the non-lethal removal of pumas that find themselves too close to humans. With luck, this new bill will make it easier for humans and mountain lions to coexist as their territories continue to overlap.